February 2017 Meeting | Roswell Lions Club, Inc.
Our guest speaker this evening was Janet Johnson, Cemetery Project Chair, Roswell Historical Society. Website http://www.roswellhistoricalsociety.org/. Janet updated us on two current projects Wreaths Across America and Old Roswell Cemetery. 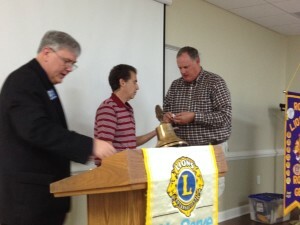 Lion Jonathan Crooks (l) inducted new Lion Leon Shelkoff (m). His sponsor is Lion Frank Beck (r). 4 vision assistance referrals since our December meeting through North Fulton Community Charities and the Drake House.